Barbara Bush complained on Monday that “compromise” had become a “dirty word.” If that’s true, it is only as a result of how it has been abused by liberal to moderate Republicans, the media, and the liberal establishment that dominates the country. Mrs. Bush is part of that establishment, so quite naturally, she is unable to see this the way the conservative base of the party does, and since she’s one who considers herself smarter than the rest of we ignorant rubes, it is now probably high time that somebody explained the problem with “compromise,” not as it is defined in the dictionary, but as it has come to be understood by most grass-roots conservatives who recoil at the word. A real “compromise” is the result of a process by which both parties to an exchange get some part of what they wanted in exchange for having yielded a little. A compromise is an exchange, if you will, trading value for value as in commerce, but it extends to many intangibles. That’s what compromise is supposed to be, but these last two decades and a bit more, that’s not what compromise has been in the United States. Instead, compromise has come to mean something else entirely, and if you ask conservatives, they will now tell you that it is approximately this: Republicans (particularly of the Establishment class) surrendering on principle to the left, gaining nothing, and getting nothing but a promise of “getting along” that never materializes, but always winds up in another kick in the teeth. If Mrs. Bush doesn’t understand this, it’s because in her insular view of the world, she doesn’t see the kicks in the teeth, and the principles at stake are not hers. It’s a relatively easy matter to yield principles belonging to somebody else, and the Bush family has a long history of doing just that. They make a pretense at being conservative, but there’s little substance behind the claim, and if truth is told, more often than not, they’re at the root of many of the sell-outs conservatives have suffered over the last two-and-one-half decades. Even before the breaking of the “Read my lips” pledge of George H.W. Bush, the elder Bush administration had begun to back-track from the idea that his was a third Reagan term, which had been the basis for his election. Of course, after the famous sell-out, the elder Bush went on to defeat, and his son George W. Bush, elected narrowly in 2000, did much the same while in office. He worked together with Ted Kennedy in a “spirit of bi-partisanship” under a supposed “new tone”(of compromise, a.k.a: surrender) to enact the No Child Left Behind program, along with the Medicare Prescription Drugs fiasco, and of course all of the bail-outs and TARP. The younger Bush famously offered that he had to set aide capitalism to save it. This last was the final straw for many conservatives, because rather than letting the market work as it should, Bush intervened in order to save big banking interests and GM, but none of this translated into “saving capitalism.” Each of these had been surrenders disguised as compromise, and everybody in the conservative movement knew it. It’s difficult to win a political debate when members of your own party are undercutting your efforts. This was the case with all of these issues. When the elder Bush raised taxes, including a stupendously destructive “luxury tax,” Democrats both chortled in contempt at the breaking of his pledge, while simultaneously urging him to break it more thoroughly. When George the younger went along with Democrats on education and prescription drugs, both times the Democrats hammered him for “not doing enough” while simultaneously waving the “compromise” in the face of conservatives. 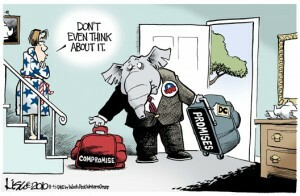 So yes, Mrs. Bush, “compromise” has become a dirty word among conservatives, and the men in your life are the cause. Just as conservatives don’t want another false conservative getting the nomination, because it defames “conservatism” by the association, conservatives are in no mood for surrenders and sell-outs of their principles that will be disguised as “compromise.” Every conservative in the country worth his or her salt knows that what the Bush clan offers as “compromise” or “conservatism” are not. That may cause Mrs. Bush some consternation, but conservatives don’t need or want her advice, and while she may get her way in this primary, that doesn’t mean real conservatives will have compromised. This one won’t. Let’s hope that as Super Tuesday gets under way, more conservatives will take this stance.